Shenzhen, the Best City in China for Manufacturing? Many Hong Kong people still shriver when they hear “Shenzhen”. It used to be a very poor patch of land along their border with the mainland. Unsurprisingly, Hong Kong people were seen as an easy target for some Shenzhen criminals. But things have changed a lot. Nowadays, most Shenzhen residents are happy with their lives. When they visit Hong Kong, they wonder how people can survive in such a tiny, cramped environment, where the basic necessities of life are so expensive. MakerBot, the famous 3D printing company, was a big advocate of “Made in USA”… until they moved production to Shenzhen! Quite simply, the North of Shenzhen might be the best location in China, and even in Asia, for a manufacturer of complex products. That’s downtown Shenzhen — basically, it is all along the border with Hong Kong. Ten years ago, Shenzhen was a real manufacturing city. Shenzhen residents used to go to Hong Kong for any “Western” activity/resource, and it was a very Chinese city (a little rough for expats). Now it hosts many service/business activities too. A new central business district was nicely planned, and feels much better than the old CBD in Luohu. Most of the petty crime that is endemic to areas of South China (especially where there are many migrant workers) has disappeared thanks to tens (hundreds?) of thousands of surveillance cameras. The Shekou neighborhood, with a few (but not all) international schools and a relatively good environment for expats, is better linked to the rest of the city (through metro and a highway). The expat community is growing — some of them coming from Shanghai for the purer air. The Chambers of Commerce tell me Shenzhen has many new arrivals than Hong Kong. Some of these areas are still rough. That’s where Shenzhen’s massive industrial base is located. There have also been a number of developments of residential areas, some of them connected to the metro. Many factories are only 30 min away from downtown by car, and less than an hour from Hong Kong’s New Territories. It means many managers and engineers can work there but live in an area they deem decent. What about the local workforce? Most Shenzhen residents self-selected to move to the city with the highest salaries in China! It means the most hard-working and ambitious young Chinese people came to the border city. Hiring good middle managers and smart office staff is much easier in Shenzhen than in neighboring Dongguan, which is still very much a manufacturing city. Another big advantage is the absence of “not born here” syndrome. From my observations, most city residents have come from another province over the past 20 years. There are no “real Shenzhen people”, the way “real Shanghai people” think of themselves. However, a real issue is the instability (and high turnover) of young migrant workers. They need dormitories, they often hate the local food, and they are not projecting themselves in this area for very long in the future. 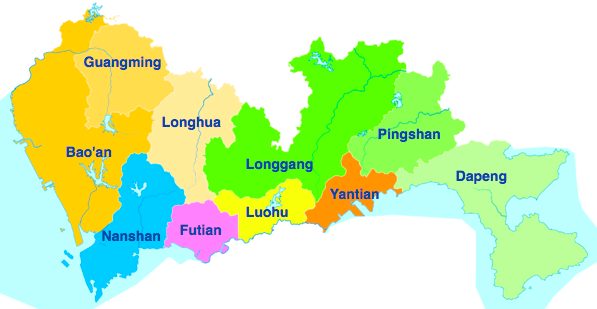 The production of electronics takes place mostly within 150 km around the center of Shenzhen (I am including the 2 neighboring cities of Dongguan and Huizhou). There is even a huge marketplace for components. This is a dynamic and growing industry, with margins usually much higher than average. As more IoT (“Internet of Things”) products get in production, it can only get busier in the near future. However, the centers of innovation are still far away. Most manufacturing projects come to Shenzhen after design and basic prototyping have been completed. A lot of the engineering is done here, but not the most value-added activities. A new and busy airport with plenty of space to grow. Good connections to Dongguan and Guangzhou (on 2 train lines), and soon also to Hong Kong. Two ports (three if the one in HK is included). Many businesspeople in Shenzhen have a company in HK for contracts with foreign companies, and only have a a ‘cost center’ on the mainland side. It is a big advantage. Is Shenzhen a first-tier city, on par with Beijing and Shanghai? I am not sure about that. It seems to be overtaking Guangzhou as the “major” business city in South China. However the decision centers in the area are spread between three cities — Hong Kong, Shenzhen, and Guangzhou. And, since Shenzhen is not a provincial capital, it doesn’t have the consulates, the regional Chamber of Commerce offices, etc. So one risk for manufacturers (at least those that haven’t bought the land they are sitting on) in the mid- to long-term is that Shenzhen becomes so successful and wealthy that costs rise much faster than in second- or third-tier cities. I will raise Renaud one by saying that for most hardware and for virtually all IoT products, Shenzhen seems to have become just about the ONLY place for manufacturing in China, and, to a large extent, in the world. I cannot even think of even one of our IoT clients not tied in with Shenzhen. It’s possible such a client exists, but every single one that springs to mind is linked to Shenzhen. As IoT continues to boom, Shenzhen no doubt will as well.